If your ankles are weak or recovering from injury, you may be looking for low-impact exercises to strengthen them. 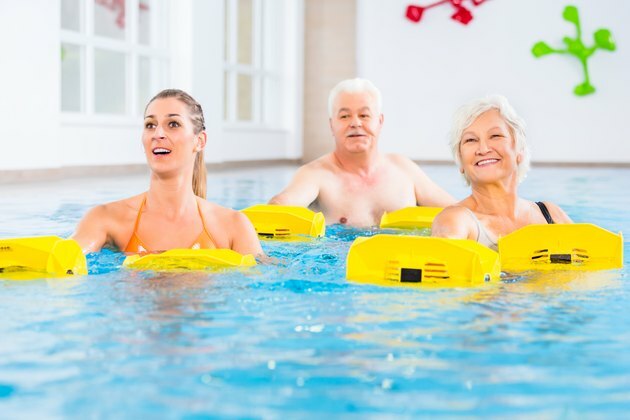 Water exercises can be both helpful and enjoyable. Water provides support and exercising in water is a gentle way to gain strength in the ankles. The buoyancy of water supports the ankles and lessens strain on the joint, encouraging free movement. The natural resistance provided by water also acts as a resistance force to build muscle strength. For a basic exercise, start by sitting in the water with your back supported and straighten your knee. While holding your knee straight, bend the ankle and point the toes. Reverse the movement to point them back towards the ceiling. After you're comfortable with this movement, perform ankle circles. Move your ankles in a circular motion, first in one direction and then the other. Perform 10 repetitions or fewer if you start feeling pain. This exercise builds strength in the outer calf muscles that connects to the ankle, and helps build strength. Place both palms on the side of the pool wall standing straight up. Put one leg behind you, keeping your heel pressed to the floor and the leg extended without bending your knee. This position looks like a lunge and should be a slow exercise. When you're in the position, bend your elbows and lean forward. Repeat several times on both sides. One simple exercise that improves ankle strength is the heel raise. Stand straight up in the pool and flex your feet to stand on the balls of your feet. Raise your heels slowly and then lower down gently. This simple exercise can be repeated as tolerated. While you can perform this exercise on dry land, the water provides greater resistance for your ankles. Perform this exercise periodically throughout the workout to improve ankle strength. This final exercise is beneficial for weak ankles. Hopping strengthens the ankle muscles as well as the tendons and ligaments surrounding the ankle. However, performing this exercise on dry land can be high-impact, potentially damaging your ankles. The cushioning protection of the water makes this an important strengthening exercise with lower impact than dry land. Stand up straight and slowly bend your knees. Hop about a foot forwards, trying to make the motion fluid. Hop the length of the shallow end of the pool or less if feeling fatigue.